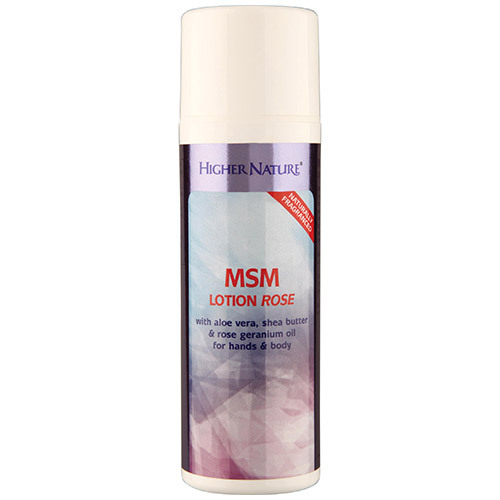 MSM Lotion Rose is an ideal lotion for hands and body - naturally subtly fragranced with Rose Geranium and Palmarosa oils and made with wild rose oil, Aloe vera, Shea butter and a full 10% of MSM. It is ideal for dry skin but suitable for most skin types including ‘problem’ skin. It also may be used on children. Not intended for use on the face. Aloe barbadensis (Aloe Vera) leaf juice, MSM (dimethyl sulfone), glycerine, Cetyl palmitate, Helianthus annuus (Sunflower) seed oil, Cetearyl olivate, Sorbitan olivate, Prunus amygdalus dulcis (Sweet almond) oil, Butyrospermum parki (Shea butter), Tocopherol (vitamin E), Panthenol (Pro-Vitamin B5), potassium sorbate, citric acid, Allantoin, Retinyl palmitate (vitamin A), Xanthan gum, Citronellol*, Geraniol*, Pelargonium graveolens (Rose Geranium) flower oil, Cymbopogon martini (Palmarosa) oil, Rosa canina (Rose) fruit oil, Linalool*. Apply to the hands and body, avoiding contact with the eyes. Ideal for dry skin and can safely be used on all skin types. Will not irritate damaged or problem skin and may be used on children. Not intended for use on the face. Below are reviews of MSM Lotion Rose with Aloe Vera & Wild Rose Oil - 150ml by bodykind customers. If you have tried this product we'd love to hear what you think so please leave a review. MSM Lotion Rose is an ideal lotion for hands and body - naturally subtly fragranced with Rose Geranium and Palmarosa oils and made with wild rose oil, Aloe vera, Shea butter and MSM.